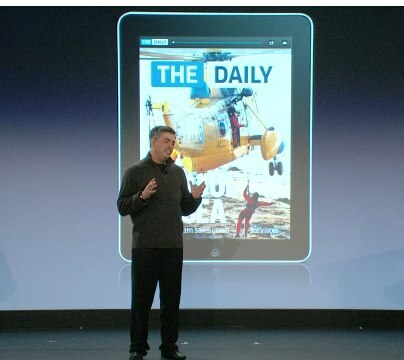 When Rupert Murdoch’s The Daily launched last week, Apple’s VP Eddy Cue got on stage to announce one-click subscriptions for iPad publications through iTunes. The Daily already has the one-click billing option as a feature, and Cue promised it would be made available to other iPad newspaers and magazines soon. Cue then started to make the rounds of print media companies in New York City to explain how subscription billing will work on the iPad. Who will have control over subscriber revenues and data has long been a point of contention between print publishers and Apple. The magazine and newspaper companies want to be able to control subscription billing by sending readers to their own sites to process iPad app subscriptions, but Apple is insisting that they use iTunes. To get through this impasse, I’ve heard that Apple is offering a compromise. Publications might be allowed to route subscribers to their own websites or payment portals to grab their credit card numbers, but they will also have to offer the option of subscribing through iTunes. It is a brilliant countermove. Apple is basically saying, “Let the subscriber decide,” knowing full well they will choose iTunes. After all, it’s simply easier for consumers to subscribe to digital publications from one place. Nevertheless, already there is some public grumbling from newspapers about being forced to go through iTunes. Except for The Daily, which got to launch first with subscriptions and only offers them through iTunes (in contrast, News Corp’s WSJ app takes you to a website to process subscriptions). Apple obviously wants the rest of the print media industry to follow The Daily‘s example—both on billing through iTunes and the 99-cent-per-week pricing. (You’ve got to wonder whether Steve Jobs had any hand in convincing Murdoch to pick that price). But if other media companies insist on fulfilling subscriptions themselves, they will have to offer iTunes subscriptions as an alternative. The print media companies want to control subscriptions for a couple reasons. They don’t like the idea of handing 30 percent of every subscriber dollar over to Apple, but even more than that they cannot afford to lose the data that comes with a direct paying relationship with readers. They could live with sharing revenues if it weren’t on an ongoing basis. After all, magazines and newspapers already share their cover price with newsstands. And iTunes is simply the new digital newsstand. The difference is that one-time newsstand buyers sometimes convert into subscribers. As most of us know, once you subscribe to a magazine or newspaper, inertia can keep you subscribing for years. Once you are a subscriber, the print media companies know a lot about you: where you live, your name, and credit card number. Those details are enough for their database marketers to create fairly accurate demographic profiles of their readers and sell this targeted, captive audience to advertisers. Selling through iTunes, on the other hand, is just a black box. Although, as part of registering for the app, publications can collect some of the same information, such as name, email, and zipcode. What they are really worried about is that iTunes will make it easier to cancel unwanted subscriptions.